I didn’t get around to flagging this on the day, but I’ve just arrived in Shanghai, and the China connection in the folly below reminded me I’d meant to write on this one. I’m here to take part in a workshop for East Asian journalists on covering climate change, and for science journalism instructors to think about how to teach this odd craft. This is exactly the kind of exchange IMHO, that might be kind of useful in a world in which a range of issues facing the public demand both knowledge and analytical skill manifest across society, if anything like democratic informed consent is ever to be achieved. Sadly, this is not a priority for your modern GOP. In fact, it is something that our empiricism-averse friends on the right actively seem to oppose. A proposal by Rep. Frank Wolf, a fierce critic of Beijing, would slash by 55 percent the $6.6 million budget of the White House’s science policy office. The measure was endorsed by a congressional committee this week, but faces more legislative hurdles, and its prospects are unclear. ….one benefit of basic forms of cooperation, such as sharing data and basic design criteria, could be to learn a little more about China’s opaque space program. Since 1999, the U.S. effectively banned use of its space technology by China. That also has a commercial downside for American producers in an increasingly globalized marketplace. “Renewing civil and commercial space cooperation with China … is not a blank check and need not provide China with sensitive technologies,” wrote James Clay Moltz of the Naval Postgraduate School in testimony at a congressional hearing on China’s civilian and military space programs in May. Economic and national security costs don’t seem to bother Wolf, who has already succeeded in attaching a ban on NASA-China Space Agency cooperation to a bill that made its way through committee in the House this month, (which is to say, fortunately, it’s still a long way from becoming law). But that act against US interests is not sufficient to slake Wolf’s thirst for stupid. Meeting twice with China’s science minister in Washington during May. Anyone who thinks that the Republican Party is actually a political institution capable of governing and suitable to be entrusted with a share of power is not paying attention. They’re a cult. 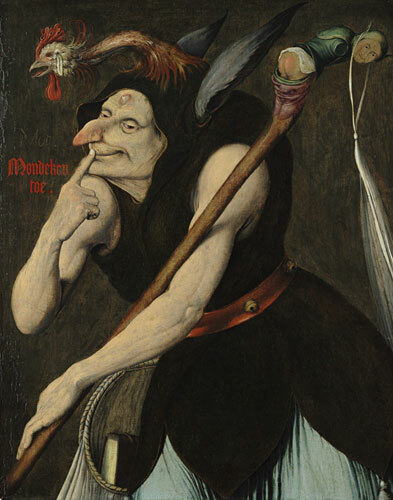 Image: Quentin Massys, An Allegory of Folly, early 16th century. I do believe I’ve used this one before. But I just can’t quit it, because there are some motley characters out there who so fit the image.